This is it. This is the launch of the fundraiser for the national campaign organisation which the Scottish Independence Convention has been developing for a while. Would we like to have got here before now? Yes, of course. But it was important that we did this right and not just fast. There have been many brilliant initiatives coming out of the independence movement. Many of them are the bright ideas and brilliant work of a small number of great, driven and innovative people. We welcome them all. Indeed, many of them are members of the Scottish Independence Convention. But from when we reformed the SIC two years ago we have believed that only a totally inclusive approach which allowed everyone to get round the table would create the unity and togetherness which could fairly represent our big, wide, diverse movement. We have worked through consensus – but consensus takes time. People who haven’t been involved in movement politics might well ask ‘how can it take six months to agree a constitution?’. But anyone who has ever tried to get dozens of organisations to work through every bit of it to make sure they are happy will tell you that this is how long it takes. And then we tried to design the rough shape of an organisation which can run a campaign on behalf of us all. We listened to everything that everyone told us. We listened and we worked hard both to meet their hopes and make changes where there were concerns. For example, many people were worried that we might repeat some of the mistakes made by Yes Scotland. They were worried we’d pay salaries that were too high, or that we’d waste money on furniture or that we’d be aloof and distant from the grassroots of the movement. When someone has spoken, we’ve not only listened but changed our plans. And again, this took time, a willingness to compromise and an awful lot of work. The hours and hours than many people have put into getting here is a credit to the tenacity and spirit of the independence movement. I am very grateful to everyone for all their efforts and for your patience while we got here. But we’re here now. We are a coalition of all of Scotland’s national pro-independence political parties and campaign organisations. We have always wanted to get the local grassroots organisations fully involved as well and now that the grassroots are setting up their own regional forums we’re inviting them to join as well – Highlands and Aberdeenshire have joined already. We believe in unity. We believe that the differences we all have on this issue or that issue are absolutely tiny in comparison to the big, hopeful idea that Scotland can be its own country. We all believe this with all our hearts and we all want to make that happen. We have no desire to get in the way of all the brilliant things which are already happening, but there are definitely more things that we need to do if we’re going to win. That’s what this is all about. It’s about doing things that help us to win. We have an organisation plan. We have started to do the research which will inform a strategy. We’ve taken all the legal and professional advice on how to make sure that this new organisation is rock-solid and that opponents can’t pick holes in it. We’ve worked really hard to get a governance model which will both let the organisation be fast and responsive but also properly accountable and working for us all. And a few weeks ago we put out a tender to get a professional company to develop an identity and name and style and feel for the organisation. We have appointed a brilliant company which has already started work. They have some really exciting plans – they’re going to design and create this working with the whole independence movement. And they’re itching to get cracking. But we can’t do any of this without your support. Unless the thousands and thousands of people in Scotland who believe in independence chip in whatever they can afford to donate, we can’t do any of this. It is simply not possible to run an effective national campaign without people and resources. Then, if you back us, if you support this initiative, it is for us to live up to your hopes. We must do the work, develop a campaign, have a real impact, make a difference. We have worked tirelessly to get here and we promise that we will keep working tirelessly until Scotland is independent. This is it. This is the coalition of the whole independence movement. This is the result of two years of work. This is the plan we have painstakingly produced. 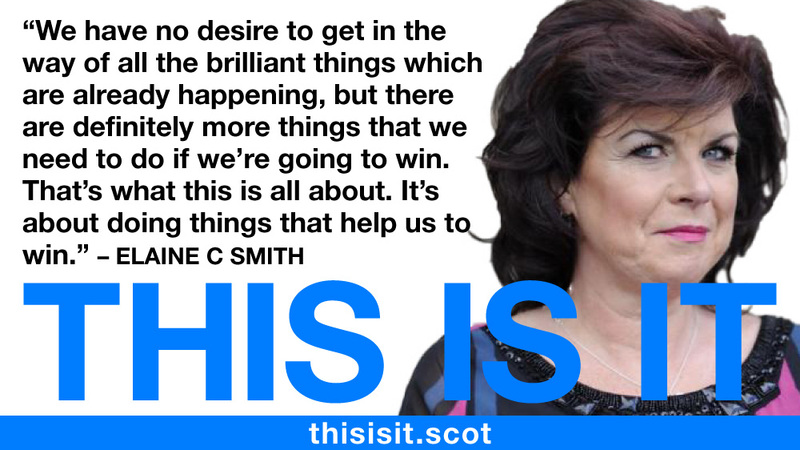 This is how we believe we can reach the hundreds of thousands of former No voters who are potential Yes voters. This is our best effort. We hope we can win your trust, your enthusiasm – and your support. Next Post: Max Wiszniewski: What SIC fundraising is about.